Instant home improvements are awesome!!! 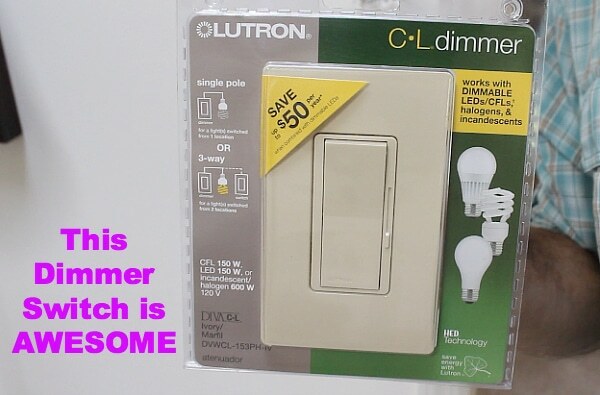 So this week I wanted to share how you can wire a dimmer light switch in 15 minutes or less. Plus save at least $79 by DIYing it. Cathy, one of our sensational fans, asked me a few weeks ago if I could do this tutorial. She has a rotary dimmer that she’d like to upgrade. Cathy, your wish is my command. My mother-in-law is also a Cathy, lol. What a coincidence because the switch in this tutorial is her’s!!! Good thing I did this project because I made a discovery that could have led to a house fire. Okay, let me show you how to replace a dimmer switch, save some dinero, and safely upgrade your home. 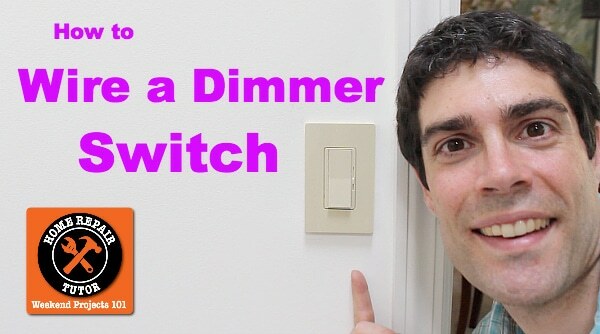 When we first moved into our current house I wanted to replace the dining room dimmer switch. I removed the switch without taking a picture of the current wiring configuration. Now I do this on every single electrical project. It’s great to have a reference picture. This is a remarkable tip and there are several more sprinkled throughout my post. Not a huge supply list at all. I know the dimmer switch is pricey. But it works with single pole or 3-way electrical boxes. And you can dim almost any kind of light bulb, including LEDs. Never use underestimate the people who use to own your house. 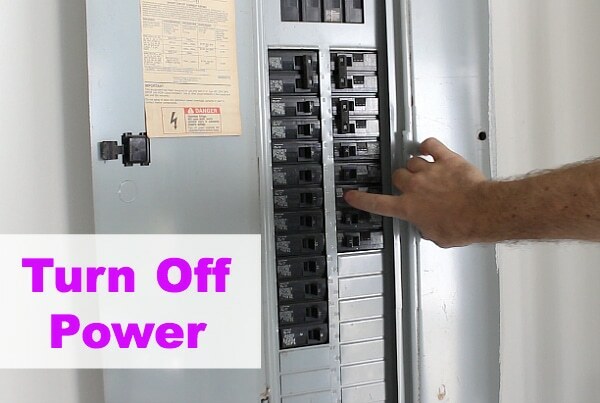 Always turn off the power to the switch at the electrical panel or fuse box. Try to turn the light back on. If it’s off that’s a good start. Remove the cover plate to the old switch by turning the screws counterclockwise. Score the painted wall that butts against the switch. 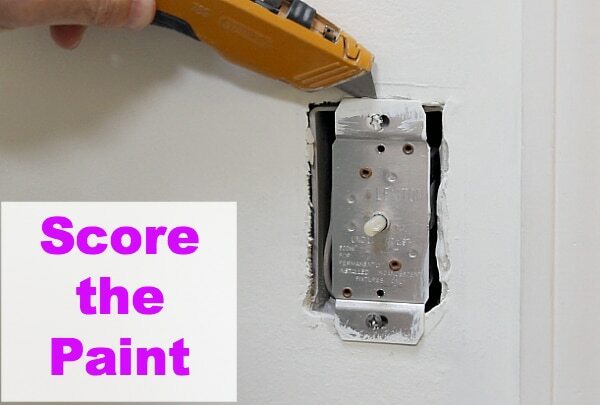 That way you won’t risk pulling the paint off the drywall when you pull the switch from the electrical box. Grab the old switch by the metal tabs and take it out from the electrical box. 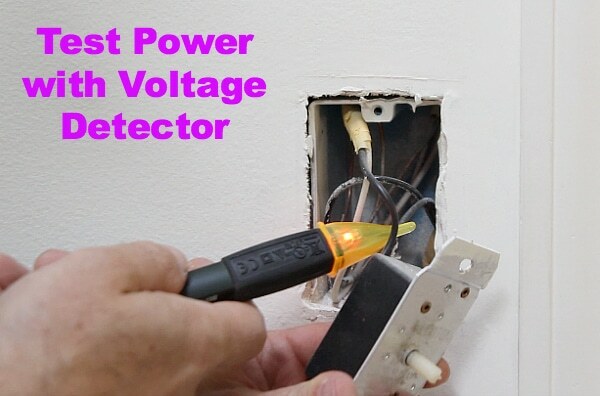 Double check the power is off by testing the wires with a voltage detector. I always do this just in case there’s some kind of goofy wiring going on. For some reason the wires in this box were spliced together with masking tape. But that doesn’t fly in my household. I know this is my mother-in-law’s house but I still like her. Before dismantling the wiring take a picture. Like I said earlier, this would have saved me a lot of grief early on in my DIY career. Check all the wires for nicks or disrepair. If the wires are in bad shape cut them with your combination stripper and strip off 3/4 inch of insulation. Once the wires are prepped you can move onto installing the dimmer switch. Lutron makes the best dimmer switch in my humble opinion. Primarily because it can accommodate either a single pole or three-was switch setup. And you can use almost any bulb on the market (incandescents, CFLs, LEDs, and halogens). My electrical box only had 3 wires: one white, one black and one ground. Usually the white wire is a neutral but it turned out to be a hot wire in this case. 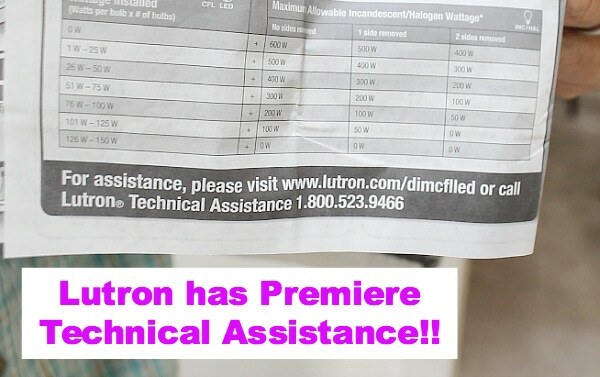 I figured this out after calling Lutron’s technical service line. By the way, it was 6:02 pm on a Friday night. And it took only 5 minutes to talk to someone live. Probably because it was Friday night. I was pretty sure how to wire the dimmer switch but just wanted some confirmation. And the technical rep was great. We figured it out together in about 2 minutes. 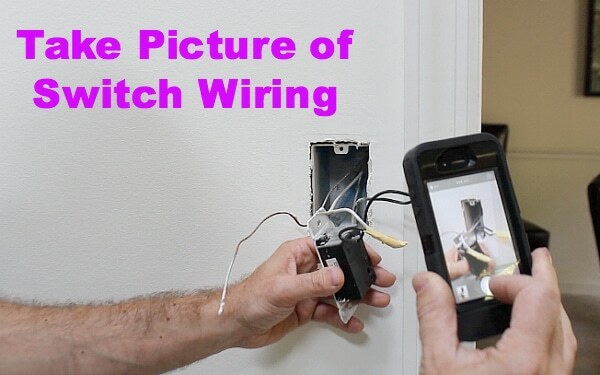 If you need help other electrical stuff this tutorial shows how to wire an electrical outlet in just a few minutes. I’ve seen some electrical jack-assery in my day, but masking tape wire nuts has to take the grand prize. I believe those are the first ingredient in baking a nice, big batch of burned-down-house-casserole. Scary stuff my friend, glad you fixed it for her. That white color hot is fairly common in residential switch boxes. It would have been code legal if they had marked it with a ring of black tape to identify it properly (at least it was that way when I was taught). Alas, whoever built that house was probably the same band of roving drunkards that wired my house. LOL, you’re totally on the mark John. I’m glad that I swapped out the switch but am a little frightened. What do the other electrical boxes look like? Right? Here’s the scary thing, the person who owned this house was the builder!!! But alas, he did build the home for his mom. So maybe she hired someone else to do the switch or did it herself. Either way makes me frightened!!! Hooray! We have VERY FEW incandescent bulbs left in this house. A pair of them reside in the can spotlights we have in our “library”. They’re on a dimmer, because there’s something very cozy about curling up to read with soft ambient light shining on the built-in bookshelves in the background. It will be SO nice to switch out the current dimmer for this model, AND do it ourselves – safely – then switch out the bulbs, too!! =D Thanks, Jeff! Hope you all have a great weekend! I love that you have a library Kiki. We all need a cozy place to read and decompress. There’s nothing like having a great book and losing yourself for an hour. Glad the tutorial helped you out. Please let me know how your project goes 🙂 and what book you’re reading. I’ m a marine electrician by trade, I work for a public shipyard and I’m not afraid of electricity. I’m more afraid of high pressure steam. I have replaced most of the light fixtures in my house and even made the one in my laundry room. I posted it at HomeTalk. It was made from a tomato cage, wire basket, clothes pins, and a light kit. Kelly, you’re awesome. Do you have the link over at Hometalk? I’d love to see it and think it would be inspiring for other DIYers. I agree, steam is scarier than electricity because it seams not as dangerous. But it can deceptively harmful. I remember working at a steel plan in college and them warning me to careful around all the steam fittings. Good advice to say the least. I do most of the wiring ‘re-dos’ in our home…mainly because I get to it before my husband has a chance. I’ve put in new dining room chandeliers, hall lights, ceiling fans, dimmers in DR and baths and replaced outlets and switches. 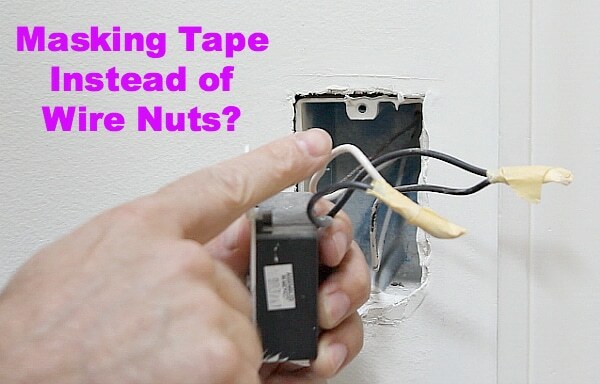 I agree…make sure the breaker is off and always double check power to the wires. I had an extra wire hot in my first house when I changed out a light; couldn’t find the ‘fuse’ to that wire, so shut off the main just to be safe. Love your ‘easy-reading’ posts. Wow, you’ve been busy Heather. Great job replacing all your electrical outlets, switches, and lights. That’s not easy stuff. I’m sure you house looks way more updated as a result of your hard work. Yah, turning off the main breaker is way easier than a call to 911. Getting shocked is no fun.